This handsome gift arrangement is a cut above the rest. It offers an incredible selection of hard and soft cheeses, gourmet crackers, a delicious selection of sausages, smoked salmon, and a cheese spreader all atop a very high end cutting board that doubles as a serving tray. This high-end cheese and sausage cutting board gift is dressed to impress! 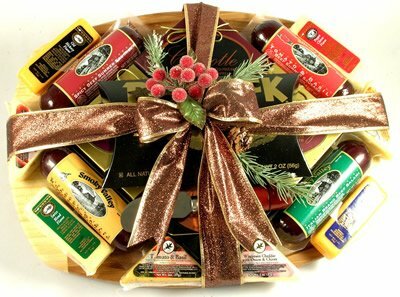 This stunning gift offers: An Ovale' Cutting Board All Natural Wild Alaska Smoked Salmon Roasted Garlic All Beef Summer Sausage Tomato and Basil All Beef Summer Sausage Italian Brand All Beef Salami Spicy All Beef Summer Sausage Zesty Cheddar Cheese Wisconsin Cheddar with Onion and Chives Tomato and Basil Cheese Swiss Blend Cheese Garden Vegetable Cheese Pepper Cheese Wisconsin Swiss Cheese Old Hickory Cheese Cranberry Cheddar Cheese Spread Merlot flavored Cheese Spread Beer Cheese Spread Chipotle Cheddar Cheese Spread Stainless Steel Cheese Spreader Gourmet Cracker Assortment This gourmet meat and cheese gift basket is guaranteed to please. Made by an organization that has been making award-winning gifts for decades. Include a free personalized gift message at checkout for your clients, friends, or loved ones! This handsome gift arrangement is a cut above the rest. t offers an incredible selection of hard and soft cheeses, gourmet crackers, a delicious selection of sausages, smoked salmon, and a cheese spreader all atop a very high end cutting board that doubles as a serving tray! Include a free personalized gift message for your clients, friends, and loved ones.